Some of the best salads I’ve ever had were in steakhouses. The best of the best was in a Chicago steakhouse, and it was so good and so big I couldn’t eat the steak. It was a ridiculously expensive piece of meat, so we had them wrap it up and we toted it back to San Francisco… and gave it to the dog, who for several days was insane with glee over her good fortune. Chopped salads are simply salads where the pieces are cut down to small and uniform pieces, and the result makes for much easier eating than a salad with large roughly torn greens and humongous veg that coat the sides of your face with dressing with every bite. I’m going to tell you what I put in there, because I think the flavors of these ingredients go very well together, but I’m not going to be specific with the amounts, because it’s up to you. 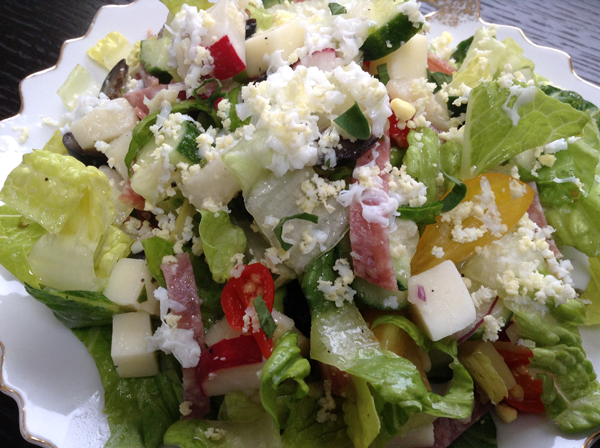 The dressing on the Chicago salad was similar to a typical Italian dressing–oily, vinegary, and loaded with herbs. I decided to use my Greek Slather and it worked really well. This is a hearty, meaty, cheesy salad, with a dressing packed with garlic and herbs. In other words, everybody into the pool, or no one at all. Don’t eat this before the theatre, or a dentist appointment, or any time you’re likely to be in close quarters with polite company. 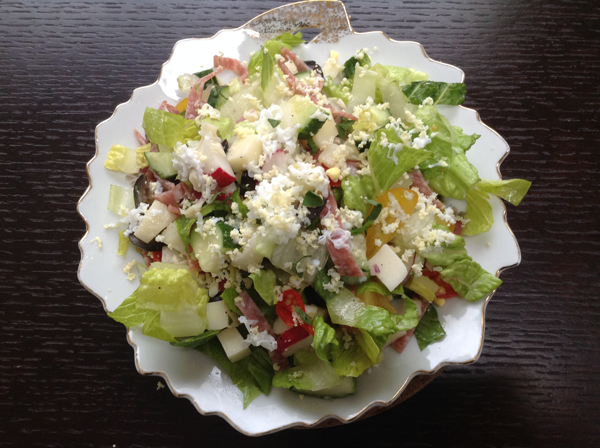 Romaine lettuce–about 1 big head for 4 servings–it’s got to be Romaine, because it’s crunchy, colorful and flavorful. Iceberg is crunchy, but watery. Other lettuces are too soft and leafy. Wash and trim and cut into small pieces. I cut the leaves down the length, and if they’re really wide, down the length again. Then chop into 1/2 inch pieces. All other ingredients should be cut into similar sized pieces. When choosing between this tomato, onion or olive, take the whole salad into consideration, and go for maximum variety in color. Toss the salad with the dressing just before serving so everything remains nice and crisp. Dish out the salad and grate the egg over the individual portions.